Snow in Truckee, what a winter it has been! Truckee, California is often the coldest place in the state of California and we get a lot of snow! You do remember the tale of the Donner Party? Well the statue in memory of that famous story is just about a mile from my home in downtown Truckee. This year is turning out to be one of those snow years to remember. Maybe not to the extent of the storm 1846, but this year is a whopper! We have really only had three big storms. One was right at Christmas time. The second was in February and went on for about 10 days. And the third is the most recent. I was seeing grass on my lawn the first part of last week and then Thursday night it started to snow again. And it snowed Friday, and it snowed Saturday, and it snowed Sunday, and it snowed today, Monday, March 21st. Isn’t this the first day of Spring? The whole week ahead looks like a snow storm! Recent measurements show just short of 9 feet of snow at 6400 feet…that’s about where my office is located which would match these photos. 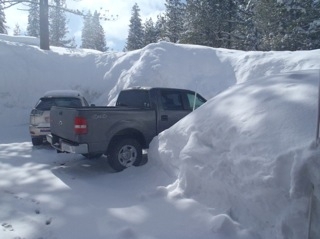 This is the snow level at the parking lot at our Coldwell Banker, Tahoe Donner real estate office. Can you imagine what the doorways to our listings look like? Maybe I should consider getting out there for some shoveling! Action, my daughter’s and my dog, (kind of shared ownership) loves the snow banks no matter how high they get. 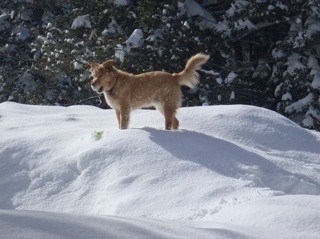 As you can see, he still found the green ball and is holding it in his mouth as he surveys his location and the best way to drop down the bank and back into the parking lot.